MARLBOROUGH, Mass.--(BUSINESS WIRE)-- Sunovion Pharmaceuticals Inc. (Sunovion) today announced that Seebri™ Neohaler® (glycopyrrolate) Inhalation Powder, 15.6 mcg twice daily, is now available at pharmacies in the United States for the long-term maintenance treatment of airflow obstruction in people with chronic obstructive pulmonary disease (COPD), including chronic bronchitis and/or emphysema. SEEBRI NEOHALER is a long-acting muscarinic antagonist (LAMA). Sunovion entered into an exclusive license agreement with Novartis for the U.S. commercialization rights to SEEBRI NEOHALER, as well as Utibron™ Neohaler® and Arcapta® Neohaler®, on December 21, 2016. Novartis received approval from the U.S. Food and Drug Administration (FDA) for SEEBRI NEOHALER in October 2015. In two multi-center, double-blind, placebo-controlled, parallel group randomized trials, SEEBRI NEOHALER demonstrated statistically significant improvements in change from baseline in lung function over 12 hours (FEV1 AUC 0-12h) compared to placebo (p<0.001).1,2 Improvements in lung function were also measured by forced expiratory volume in one second (FEV1) and forced vital capacity (FVC) within five and 15 minutes post-dose versus placebo on Day 1 and Week 12. Results showed reduced use of rescue medication and improvements in health-related quality of life, as measured by the St. George’s Respiratory Questionnaire (SGRQ) total score, which is a composite of patient-reported symptoms, activities and impact on daily living. Additional medical information, patient assistance and other information about SEEBRI NEOHALER is available through Sunovion Answers at https://www.seebri.us/sunovion-answers.html or by calling 1-844-276-8262 Monday through Friday from 8 a.m. to 8 p.m. ET. A long-acting muscarinic antagonist (LAMA) is a type of long-acting bronchodilator, along with long-acting beta2 agonists (LABAs). According to the GOLD report, these are currently the first-line standard of care maintenance therapy for symptomatic patients with COPD, and help the muscles around the airways in lungs stay relaxed to prevent symptoms such as wheezing, coughing, chest tightness and shortness of breath.3 LAMAs and LABAs are widely used and important therapeutic approaches for people with COPD. Seebri™ Neohaler® (glycopyrrolate) Inhalation Powder, 15.6 mcg twice daily, is a long-acting muscarinic antagonist (LAMA) approved in the U.S. for the long-term maintenance treatment of airflow obstruction in people with COPD, including chronic bronchitis and/or emphysema. 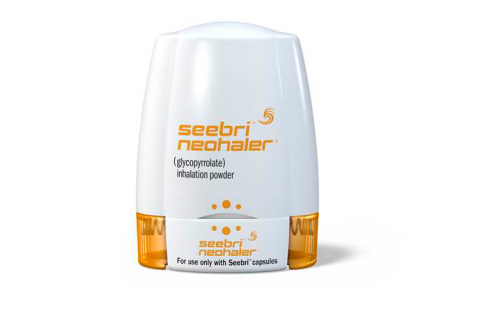 SEEBRI NEOHALER is delivered by a dry powder inhaler (DPI), and its active ingredient, glycopyrrolate, has an established safety and efficacy profile. In clinical trials, SEEBRI NEOHALER improved lung function and showed reduced use of rescue medication and improvements in health-related quality of life, as measured by the St. George’s Respiratory Questionnaire (SGRQ) total score, which is a composite of patient-reported symptoms, activities and impact on daily living. The most common adverse reactions (≥1% and more common than placebo) reported in two 12-week clinical trials with SEEBRI NEOHALER (and placebo) were: upper respiratory tract infection, 3.4% (2.3%); nasopharyngitis, 2.1% (1.9%); urinary tract infection, 1.4% (1.3%); sinusitis, 1.4% (0.7%); oropharyngeal pain, 1.8% (1.2%). Please see full Prescribing Information for SEEBRI NEOHALER at http://seebri.sunovion.com. SEEBRI™ NEOHALER® (glycopyrrolate) is a medicine called an anticholinergic. SEEBRI NEOHALER is used long term, twice each day (morning and evening), for maintenance treatment of chronic obstructive pulmonary disease (COPD), including chronic bronchitis and/or emphysema. Do not use SEEBRI NEOHALER unless your health care provider has taught you how to use the inhaler and you understand how to use it correctly. Use SEEBRI NEOHALER exactly as your health care provider tells you to use it. Do not use SEEBRI NEOHALER more often than it is prescribed for you. Do not stop using SEEBRI NEOHALER or other medicines to control or treat your COPD unless told to do so by your health care provider because your symptoms might get worse. Your health care provider will change your medicines as needed. Get emergency medical care if your breathing problems worsen quickly, you need to use your rescue medication more often than usual, or your rescue medication does not work as well to relieve your symptoms. Do not use SEEBRI NEOHALER if you are allergic to glycopyrrolate or any of the ingredients in SEEBRI NEOHALER. Ask your health care provider if you are not sure. Tell your health care provider about all the medicines you take, including prescription medicines, over-the-counter medicines, vitamins, and herbal supplements. SEEBRI NEOHALER and certain other medicines may interact with each other. This may cause serious side effects. Especially tell your health care provider if you take anticholinergics (including umeclidinium, tiotropium, ipratropium, aclidinium, glycopyrrolate). Common side effects of SEEBRI NEOHALER include upper respiratory tract infection, sore throat, and runny nose. These are not all of the possible side effects with SEEBRI NEOHALER. Tell your health care provider about any side effect that bothers you or that does not go away. Do not swallow SEEBRI capsules. SEEBRI capsules are for inhalation only with the NEOHALER device. Never place a capsule in the mouthpiece of the NEOHALER device. SEEBRI capsules should always be stored in the blister strip and only removed immediately before use. For additional information, please see full Prescribing Information and Patient Information for SEEBRI NEOHALER, or visit www.SEEBRI.us. The NEOHALER inhaler is a handheld device designed to deliver UTIBRON, SEEBRI and ARCAPTA capsules, which should not be stored or pre-loaded into the inhaler. The NEOHALER inhaler offers a feedback mechanism that allows patients to see whether or not there is any medication left in the capsules, while giving them the flexibility to inhale any remaining dose. The ability to provide dosing feedback is an important feature for patients and physicians. The NEOHALER inhaler is also small enough to carry easily in a pocket, bag or purse. Sunovion is a global biopharmaceutical company focused on the innovative application of science and medicine to help people with serious medical conditions. Sunovion’s vision is to lead the way to a healthier world. The company’s spirit of innovation is driven by the conviction that scientific excellence paired with meaningful advocacy and relevant education can improve lives. With patients at the center of everything it does, Sunovion has charted new paths to life-transforming treatments that reflect ongoing investments in research and development and an unwavering commitment to support people with psychiatric, neurological and respiratory conditions. Sunovion’s track record of discovery, development and/or commercialization of important therapies has included Utibron™ Neohaler® (indacaterol/glycopyrrolate) Inhalation Powder, Brovana® (arformoterol tartrate) Inhalation Solution, Latuda® (lurasidone HCI) and Aptiom® (eslicarbazepine acetate). Headquartered in Marlborough, Mass., Sunovion is an indirect, wholly-owned subsidiary of Sumitomo Dainippon Pharma Co., Ltd. Sunovion Pharmaceuticals Europe Ltd., based in London, England, and Sunovion Pharmaceuticals Canada Inc., based in Mississauga, Ontario, are wholly-owned direct subsidiaries of Sunovion Pharmaceuticals Inc. Additional information can be found on the company’s web sites: www.sunovion.com, www.sunovion.eu and www.sunovion.ca. Connect with Sunovion on Twitter, LinkedIn, Facebook and YouTube. About Sumitomo Dainippon Pharma Co., Ltd.
Sumitomo Dainippon Pharma is among the top-ten listed pharmaceutical companies in Japan operating globally in major pharmaceutical markets, including Japan, the United States, China and the European Union. Sumitomo Dainippon Pharma aims to create innovative pharmaceutical products in the Psychiatry & Neurology area and the Oncology area, which have been designated as the focus therapeutic areas. Sumitomo Dainippon Pharma is based on the merger in 2005 between Dainippon Pharmaceutical Co., Ltd., and Sumitomo Pharmaceuticals Co., Ltd. Today, Sumitomo Dainippon Pharma has about 6,500 employees worldwide. Additional information about Sumitomo Dainippon Pharma is available through its corporate website at www.ds-pharma.com. LATUDA and SUNOVION are registered trademarks of Sumitomo Dainippon Pharma Co., Ltd.
BROVANA is a registered trademark of Sunovion Pharmaceuticals Inc.
APTIOM is a registered trademark of BIAL, used under license. ARCAPTA and NEOHALER are registered trademarks of Novartis AG, used under license. SEEBRI and UTIBRON are trademarks of Novartis AG, used under license. © 2017 Sunovion Pharmaceuticals Inc. All rights reserved. 1 L Force, C, Feldman G, Spangenthal, et. al. Efficacy and safety of twice-daily glycopyrrolate in patients with stable, symptomatic COPD with moderate-to-severe airflow limitation: the GEM1 study. International Journal of COPD. 2016:11: 1233-1243. 3 GOLD Guidelines 2017. http://www.goldcopd.org/guidelines-global-strategy-for-diagnosis-management.html. Accessed: March 16, 2017. 6 National Heart, Lung and Blood Institute. (2013). What Are the Signs and Symptoms of COPD? Retrieved from https://www.nhlbi.nih.gov/health/health-topics/topics/copd/signs. 7 Partridge MR, Karlsson N, Small IR. Patient insight into the impact of chronic obstructive pulmonary disease in the morning: an internet survey. Curr Med Res Opin. 2009;25:2043–8. 8 Roche N, Small M, Broomfield S, Higgins V, Pollard R. Real world COPD: association of morning symptoms with clinical and patient reported outcomes. COPD. 2013;10:679–86. 9 Agusti A, Hedner J, Marin JM, Barbé F, Cazzola M, Rennard S. Night-time symptoms: a forgotten dimension of COPD. Eur Respir Rev. 2011;20:183–94.